Sometimes a yarn just doesn’t want to be spun. I have mentioned before that I’m less than inspired to spin lately. Well, when a friend came over to knit, it seemed like the perfect time to finish the suri alpaca yarn I started at least a month ago. Circumstances conspired to make it more difficult. First, there was Derby. He just did not want me to pay attention to anything but him. I’ve learned how to spin around him, although it is not the easiest thing to do. 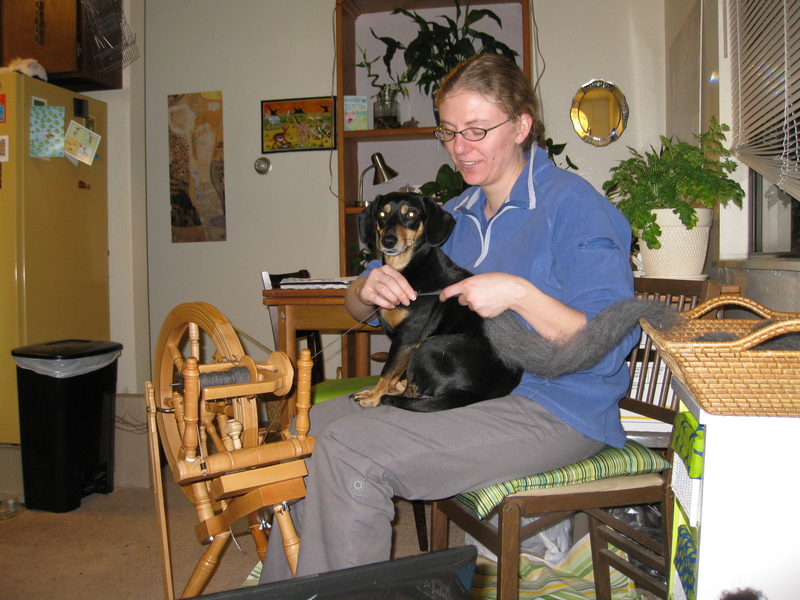 Eventually I pushed him off my lap and switched to Aunt Geri’s wheel, which spins faster for plying. And then Aunt Geri’s wheel broke. The footman, which attaches the treadle (the foot pedal) to the wheel, splintered. Luckily, the wheel is big enough that it has some serious inertia. 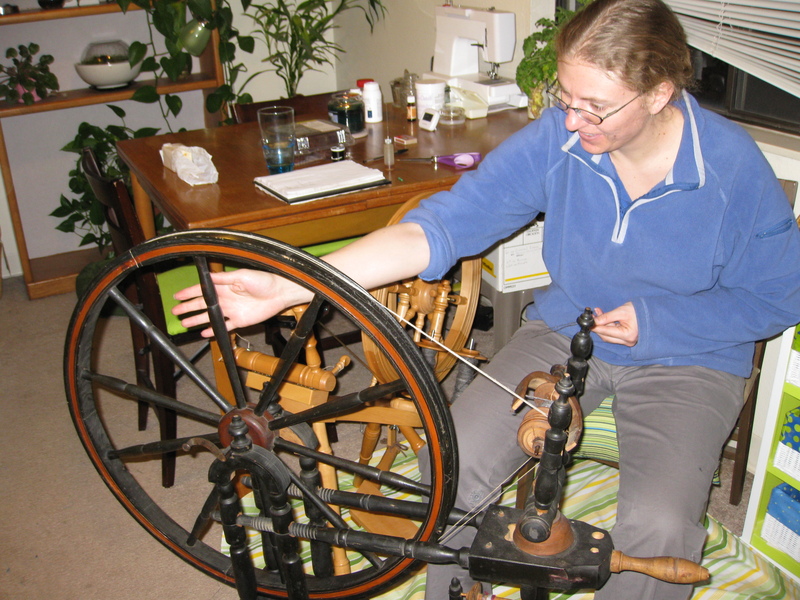 I turned the wheel with my hand, and it kept going for a little while so I could ply. It took me longer, but I finished the yarn eventually. 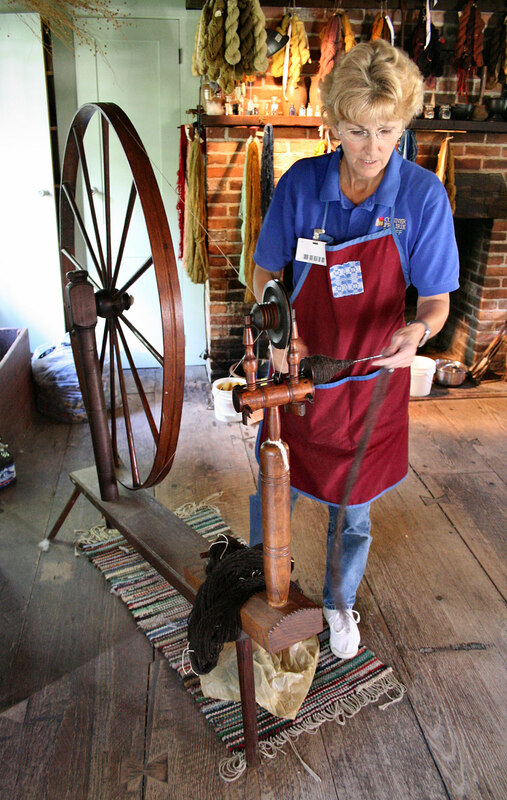 There was a time when all spinning wheels were turned by hand. These huge wheels had enough weight to spin for awhile, and the spinner would start them turning, then walk over to the other side to draft for a while. They are called great wheels, or walking wheels, because you had to walk back and forth in front of them. This entry was posted in fiber art and tagged art yarn, dogs, great wheels, hand spinning, hand spun, spinning, spinning wheels, suri alpacas, walking wheels, yarn. Bookmark the permalink.